CES 2018 was a consumer electronics tradeshow that brought more than 175,000 international attendees and 4,000 exhibitors to Las Vegas during January. 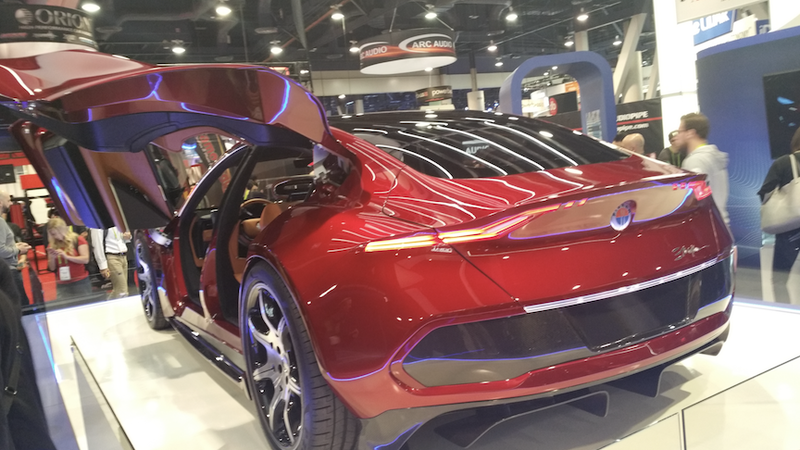 The automotive exhibits within CES this year included over 170 companies and eleven major auto manufacturers. The annual international electronics trade show has also been rated as the 10th largest car show within the US. Each year, the newest innovations in electric drive trains, advanced driver assistance systems, and autonomous vehicles are usually unveiled for the first time at this venue, ahead of the North American International Auto Show in Detroit, Michigan that is usually staged two weeks later each January. Jim Hackett, Ford Motor Company CEO, gave a keynote speech about transportation infrastructure during the first day of the tradeshow that showcased a new approach from the company. Hackett came to Ford from outside the car industry and has been spending time with Chairman Bill Ford to rethink how automobiles can be interconnected with urban environments. Hackett emphasized that company founder Henry Ford’s original vision of providing freedom and progress for American citizens through cheaper transportation succeeded greatly in moving lifestyles outside city limits onto open roads and into “sub-urban” housing expansions. However, urban centers lost their human connections and “shared sense of belonging”, as populations and traffic jams became more dense, requiring the need for more parking regions in a city that displaced gathering spaces, small service businesses, and interactive communication among residents within downtown city centers. Hackett observed that, as technology has gotten faster, bigger, and “more”, it has also become more invasive. People have become anxious about the impact on their private lives and even on civic life in general. How can Ford Motor Company harness changing automotive technologies to improve lives, serve human needs and re-establish a general sense of community within urban city centers? The company is currently proposing and leading several engineering solutions aimed at improving the quality of life for both urban drivers and residents, a concept that Hackett calls “living streets”. How can roads become hospitality curbs and transportation corridors that improve the quality of life for small business owners and employees who live, work and play in the same location? One automotive solution is to enable smarter transportation in cities by creating a software tool called a Transportation Mobility Cloud (TMC) that would be open for interactive usage by city managers, local non-profit organizations and business developers alike. Data acquisition by the TMC would be aided by installing data connectivity into all of Ford’s new vehicles, a development program the company calls Connected Vehicle To Everything (CV2X). Ford is also increasing investment in the electrification of its product line by $11 billion through 2022. Ford will be partnering with Domino’s Pizza and Postmates to develop self-driving vehicles and fleets that can move food and package deliveries autonomously. Ford has also partnered with business developers to brand personal “last mile” transportation for urban travel, such as electric bicycles and electric scooters. Honda considers itself a robot company, as well as an automotive manufacturing company. 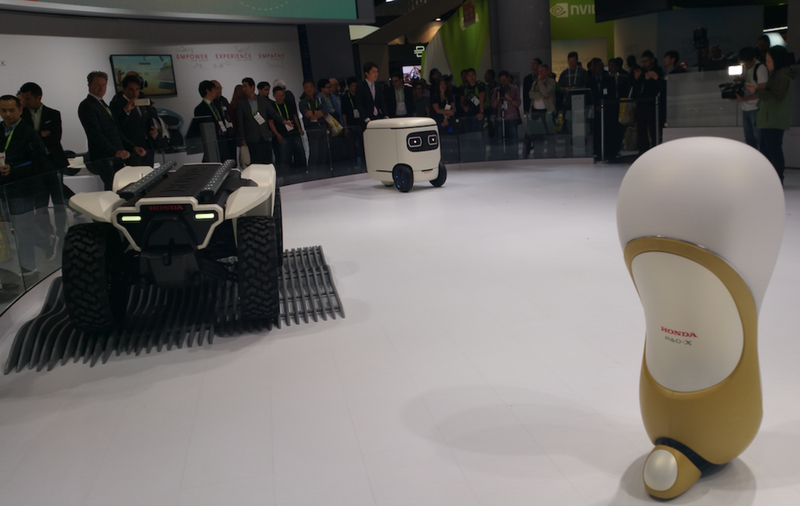 The CES 2018 display in the North Hall of the Las Vegas Convention Center emphasized the need to make the robotics technologies within cars more friendly, intuitive and empathetic while being connected to people and the surrounding world. Honda emphasized its empathetic and friendly robotics technologies. During CES 2018, the Toyota booth featured a concept of an autonomous shuttle bus that included see-through LED display billboards on either side panel of the vehicle. The internal space within the shuttle bus could be reconfigured as more than just rows of seats. The display billboards pictured the vehicle as a traveling office space, sleeping quarters, or mobile party room. Toyota autonomous bus with advertising billboards on side panels. Both Hyundai and Kia automotive companies from South Korea were showing advanced concepts of the two companies’ electrified automotive platforms. Hyundai unveiled its “Nexo” fuel-cell powered electric vehicle while Kia gave a closeup look at its “Niro” battery-powered electric car. Hyundai unveiled its Nexo fuel-cell EV at CES 2018. Kia already makes a hybrid and plug-in hybrid version of the Niro. The company introduced a new all-electric model during CES 2018, that will complete the drive train options available, similar to the three Hyundai Ioniq product lines. Kia introduced its Niro Electric Car during CES 2018. During November 2017, Delphi spun off its automotive drive train division as a standalone company called Aptiv, that has focused on developing autonomous, self-driving vehicles for major automotive manufacturers. Delpi Technologies displayed internal component systems that will enable 800-volt electric drive trains. During CES 2018, Aptiv partnered with Lyft ride-hailing company to give demos of Level 4 autonomous cars, developed on BMW platforms, that could drive themselves to passenger destinations around Las Vegas. During the demonstration, a driver was always behind the wheel, but driving operations were performed without human intervention within real-world city traffic during a busy CES 2018 trade show that welcomed over 175,000 additional visitors to the Las Vegas Strip and convention centers. The Lyft service office was temporarily based in an Airstream trailer on the Gold lot of the Las Vegas Convention Center where ride-hailing app menus were demonstrated to potential passengers by Lyft employees. When an autonomous vehicle arrived at the Gold lot hub, passenger destinations were entered into each vehicle’s GPS system. These included trips to Caesars Palace along Las Vegas Blvd, as well as 19 other destinations. Aptiv-labeled autonomous research vehicles were also found at other exhibit booths of major automotive manufacturers within the Las Vegas Convention Center, including Audi. Delphi Technologies has continued to develop the internal component systems that will power the next generation of electric-drive vehicles. Within the next three years, Delphi engineers are anticipating that traction battery pack sizes will increase from 400 Volts DC to 800 Volts DC, along with larger power transistors and inverter modules to convert and carry this higher power from the battery pack to the electric drive train. Larger battery packs with more power should continue to improve the range and performance for electric cars, while also encouraging faster recharging rates of battery pack modules up to 350 kilowatts. New power transistors made from silicon carbide (SiC) materials inside Metal Oxide Silicon Field Effect Transistors (MOSFET), as well as silicon-based Insulated Gate Bipolar Transistors (IGBT) are already capable of high-speed switching and control of 800-volt electric motor systems. The venerable 12-volt auxiliary battery that normally provides power to all the peripheral electronics in a vehicle will also go through an upgrade over the next few years to a standardized 48-volt system. These higher-capacity batteries will more reliably carry low-voltage currents to vehicle lighting, sensor, computing, and actuator systems that will be included in new vehicles, from stop-start mild hybrid systems to fully autonomous electric-drive vehicles. A 48-volt standard auxiliary battery system is still considered a low-voltage power system (blue and yellow cabling) for third-party product implementation on a vehicle, compared to more rigorous standards required for high-voltage traction battery packs (orange cabling). Continental is another automotive tier-one components supplier who is also developing systems for electric car drive trains. The company exhibited some of its integrated electric motor and inverter systems, that employ boost electronics to help regulate 400-volt as well as 800-volt drive systems. The company has also partnered with ABB to enable DC Fast Charge systems for quicker recharging of traction battery packs. Continental exhibited its integrated electric-motor drive train capable of supporting 800-volt traction battery systems. Commercial versions of LIDAR (Light Detection and Ranging) sensors have become more popular for implementation on autonomous cars because of their capability to quickly detect both shape and depth of oncoming vehicles, obstacles or people. 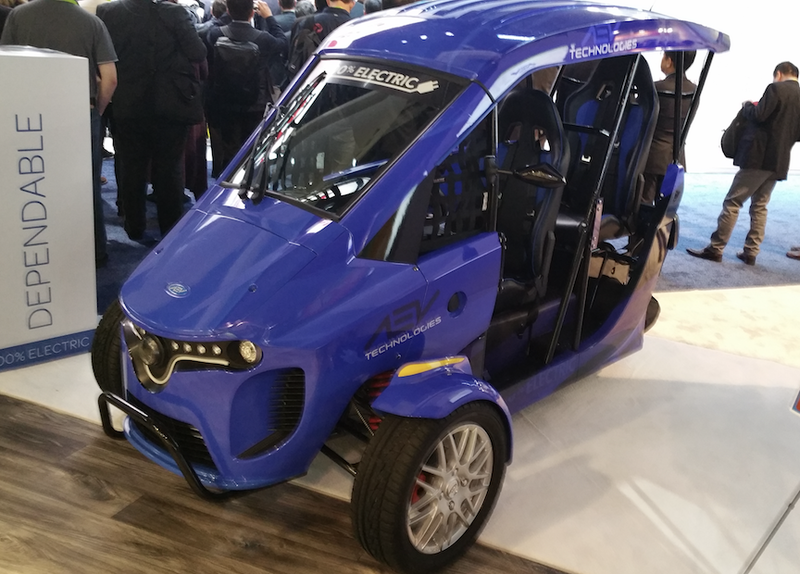 Velodyne has been a leader in this development space and rolled out several different products, that were showcased on a new NAVYA robotaxi platform. Interior of NAVYA Robotaxi with two passengers, no steering wheel and no human driver. NVIDIA is a 25-year old company that started up in California’s Silicon Valley to make graphics accelerator chips to improve the quality of visual displays for personal computers. The company developed a graphic processing unit (GPU) that could enhance the central processing unit (CPU) microprocessor in personal computers by offloading compute-intensive graphic modeling tasks. The company became a driver in the computer gaming industry with its graphics accelerator printed-circuit boards that could plug into expansion ports in PC-compatible computers. A GPU speeds up the formation of graphics artwork on a computer monitor by processing electronic instructions and data through multiple parallel paths at the same time, compared to a CPU than processes a wider variety of computing tasks through slower sequential steps. For many decades, researchers in the realm of artificial intelligence have been seeking to duplicate human senses and cognition inside computer circuitry. The two most important areas of research were in vision recognition and natural language voice recognition, in order to duplicate the way humans use their two keenest senses to understand and navigate the world about them. During 2012, Geoffrey Hinton, Alex Krizhensky and Ilya Sutskever from the SuperVision research lab at the University of Toronto in Canada, pioneered the use of neural network software models coupled with GPU processing systems from NVIDIA to create AlexNet. The research team conceived that convolutional manipulation of input variables and output errors could create feedback that would make ongoing changes to the weights of AlexNet’s internal processing algorithms. The result was “deep learning” by the software model that could write its own software to modify how it would process and perceive progressive sets of incoming data. The team focused its artificial intelligence research on graphics image recognition, in order to group similar digital images of objects together through eight processing layers of visual filtering. Instead of programming the image-recognition algorithms directly, Krizhevsky enabled AlexNet to “learn” the common characteristics of similar graphic objects by feeding the neural net massive amounts of images that it could compare, while the software model adjusted its own internal software processing algorithms with each error. During an international ImageNet Large Scale Visual Recognition Challenge in 2012, AlexNet outperformed all other existing benchmark tests of image recognition models that had been previously hand-coded by humans, while running on two NVIDIA GPU graphics processing stations. AlexNet neural net software was capable of writing its own internal software more quickly than humans could do directly, achieving a recognition error rate that was ten percentage points less than its nearest competitor. After the competition, large corporations like Google, Facebook, Amazon, and Microsoft began duplicating the GPU technology used in this image recognition model, to improve each company’s graphic image search and tagging engines. Microsoft’s ResNet was scaled to 152 layers of image filtering, compared to just eight layers in AlexNet. At Stanford University, AI researcher Andrew Ng applied GPU processing to natural language voice recognition algorithms and succeeded in improving the ability of computer technologies to recognize and caption spoken words. Ng has since become a chief scientist at Baidu, where he has applied this technology to translate spoken Chinese words into readable Chinese characters. NVIDIA also worked with Tesla Motors, who used its Tegra GPU in early versions of the Model S electric car to develop Autopilot driving features. The Autopilot system could quickly process and filter both images and input data from onboard sensors, that included a forward-facing camera, forward-facing radar and a 360-degree ring of ultrasonic sensors embedded around the body of the electric car. NVIDIA unveiled sponsored RoboRace autonomous Formula E-sanctiond race car during CES 2018. Since 2014, NVIDIA has developed its own GPU technology, by creating products specifically for the automotive market. The company’s Volta GPU processor is focused on automotive applications. NVIDIA’s recent announcement for CES 2018 is that the company has integrated 512 Volta GPU processors along with 8 ARM CPU processors into a single silicon chip it calls Xavier, with lots of input and out ports to connect multiple sensors and actuators on a CAN automotive bus. The company also includes a software development environment with Xavier that includes NVIDIA DriveWorks Operating System that can link Xavier’s internal processing AI to a cloud-based mapping systems with high definition for detailed route navigation references. The Xavier driving platform can process 30 trillion operations per second (Tera-ops) while consuming just 30 watts of power, allowing the integration of a supercomputer on a mobile transportation platform. NVIDIA has linked two Xavier processors together on its Pegasus circuit development board that can achieve 320 TOPs of processing speeds for AI inferencing. The single PC board can replace a supercomputer and will be used to test potential autonomous level 5 driving platforms by Volkswagen, Hyundai and Aurora, including some of the Robotaxi applications shown during CES 2018. The Xavier GPU is undergoing certification for safety and resiliency through the automotive industry ASIL (Automotive System Integrity Level) standards committee, as well as the International Standards Organization’s ISO 26262 validation for the company’s integrated circuit manufacturing process and software platforms to insure transparent traceability of any supply chain or development problems that may show up later during actual applications. The Xavier chip is currently rated ASIL-C while the Pegasus board has been rated ASIL-D. NVIDIA is striving to achieve ASIL-0 certification, that would be validated at the highest level of automotive functional safety. To test the effectiveness of an autonomous vehicle design, NVIDIA has also created its AUTOSIM virtual reality 3D simulation environment for the automotive industry. Already successful in creating photorealistic images for the gaming industry, the company’s GPUs can create multiple simulation scenarios that can run an automated vehicle model through billions of road trip scenarios at supercomputer speeds. This helps an automotive designer or engineer get a realistic feel for the effectiveness of sensor placement on a vehicle, as well as performance reliability during changing weather conditions, road conditions and oncoming vehicle traffic by creating as many test scenarios as the designer can imagine. Fisker EMotion concept electric car with both gull wing and scissor doors. Henrik Fisker has revived Fisker Automotive after selling the Karma electric car design to a Chinese automotive manufacturer when the original company faced bankruptcy. The company’s second electric car effort is called the EMotion and a concept version of the vehicle was displayed during CES 2018. Austin EV three-wheel electric motorcycle. Austin EV is a new startup company that has emerged from the capitol city of Texas during the last three years to develop electric utility truck platforms and three-wheel motorcycles. 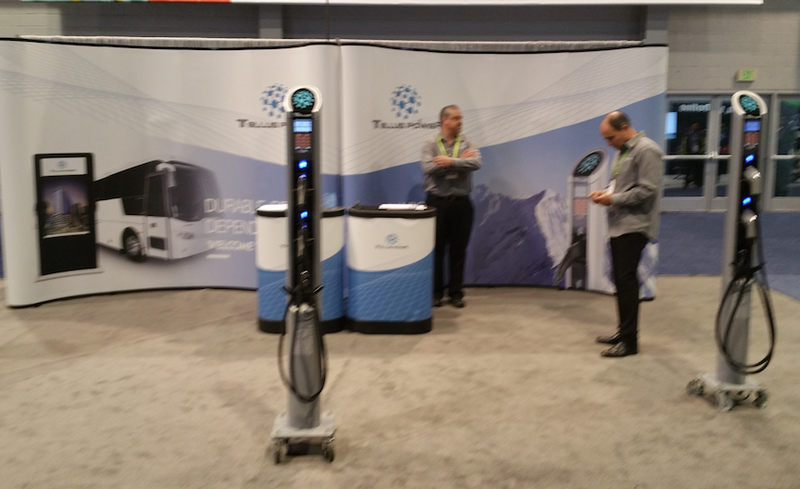 The company exhibited in the North Hall of CES 2018 for the first time. The electric trucks and carrier beds are configurable as an urban delivery van or an off-road dump truck. Ampere is a startup company from southern California that exhibited its Ampere 1 three-wheel electric motorcycle during CES 2018. The starting price of the vehicle is $10,000. ChargePoint Exhibit Booth at CES 2018 displayed SAE J1772 AC Level 2 EVSE product lines for commercial and personal use. ChargePoint has now added an Alexa voice-controlled interface to its personal garage charging station, that also has more direct connections through a customize-able mobile phone app. In the Smart Cities Pavilion within CES 2018, Electric Loading displayed a Fanuc industrial robot arm that was portrayed as an automated electric car EVSE charging attendant. Two tool appendages were developed by the company for both CHAdeMo and SAE CCS Combo connectors for DC Fast Charging that could be electronically and pneumatically connected to the Fanuc robot arm. With the aid of an onboard stereoscopic vision system, the robot could automatically plug either connector into the DC Fast Charge port of a stationary electric vehicle. Nevada Governor Brian Sandoval is now Chairman of the National Governors Association during 2018. He hosted a meeting of the NGA with over 20 state governors at a Lake Las Vegas resort at the same time as CES 2018. During the event, he showcased autonomous vehicles, including the new NAVYA Robotaxi. NAVYA has partnered with Keolis to integrate autonomous shuttle buses and robotaxis into the Las Vegas Innovation district. The City of Las Vegas also sponsored a prominent booth exhibit in the Smart Cities Pavilion during CES 2018, that featured vendor partners within the downtown Innovation District. Representatives from the Las Vegas Department of Information Technology, led by CIO Michael Sherwood, were on hand to answer questions about how sensors and autonomous vehicles could be integrated within city infrastructure to improve transportation and city services. Newer PostJust how is the Chevy Volt different?